Flying Eagle penny values are $15 minimum and are often driven higher by their popularity with a large collector demand. Three dates are involved, and each is valued separately. 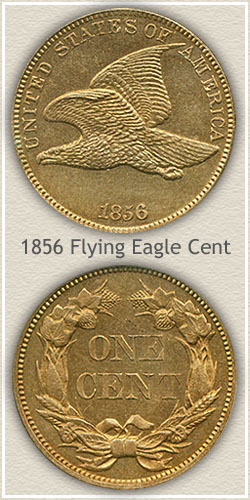 The 1856 flying eagle is far and away the rarest of this short series, few were minted and fewer still exist today. Following this rarity is the 1857 penny often found with heavy wear. And the final date, any 1858 penny is collectible, but valued as all old coins are, depending on the amount of wear. Wear affects the condition of your coin and is rated with a "grade" by comparing it to the images below. As an example to the right is an "uncirculated" flying eagle penny, still in brand new condition, rarely found this nice and accordingly at the high end of the value chart. 1856 through 1858 cents stand out as sought after collector coins because of the bold flying eagle design. A big departure from the usual Liberty portraits found on other series at the time. Additionally the Flying Eagle penny was a significant reduction in size from the large cents of prior years. Your old penny pioneered the small cent coins used today, following is a listing of how much they are worth. Flying Eagle penny values listed are a computed average from dealer's price lists with various wholesale factors figured in. They reflect closely the price you would expect to receive when selling. Variations in how much your coins are worth do occur subject to subtle grading points, collector demands and dealer needs. Here is a quick, behind the scene look at how the above prices in the Coin Value Guide are pulled together. 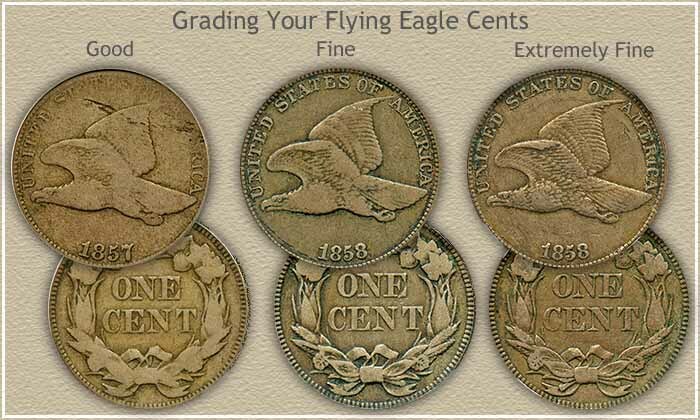 Judge your coin’s condition carefully and match their appearance to one of the different "grades" found on the image below. The subtle degrees in wear, or lack of it, places your coin in a higher or lower value category. Dealers and collectors view coins from a "desirability" point of view and are willing to pay more for coins with the least amount of wear and abuse. Good Condition: Heavy wear from circulation has left the eagle as only a profile with few of the major design elements remaining. Parts of the rim are weak and merging into the lettering. On the reverse the bow has blended with the wreath. Fine Condition: Roundness to the design elements is what pulls this coin’s grade up. Wear has eliminated some details on the chest and tail of the eagle. The majority of the feathers in the wing show but are smooth towards the edges. The bow on the reverse shows separation from the wreath. Extremely Fine Condition: All parts of the design show and have a sharpness to their look. Wear is confined to the highest portions causing some leveling of the contours. Examine the feathers, too much blending of one feather into the next and the grade is lowered. In extremely fine condition greater Flying Eagle penny values hinge on the high point detail remaining. The lofty value of the 1856 cent is caused first of all, by a very low mintage, a couple thousand in total. This new design was struck as test examples and handed to congressmen, other prominent individuals and collectors at the time. As a result most were well cared for and the majority surviving today are in high condition. However a sizeable amount of these exhibition pieces were spent and did slip into circulation. When offered for sale these circulated Flying Eagle cents are still valued into the many thousands of dollars. Interestingly heavily worn examples are less often encountered because of the nature their original distribution. Another fact surrounding 1856 cents is part of the total were minted as "business" strikes, representing those intended for commerce and others as special "proof" strikes. The difference in the two is distinguished by heightened, bolder detail found on the proof issues. Both are very popular and trade equally well in the same value range. All old coins and certainly Flying Eagle penny values have increased steadily as the years pass. Demand from serious long term collectors has remained strong and additional interest as new collectors take up the hobby adds to rising prices. Coin values listed. From the earliest Half and Large cents, to Indian head pennies to the popular Wheat pennies of 1909 to 1958. Match you coins to the grading images and value charts. Some of these old pennies have amazing values. All old US coin values. The home page is an excellent index, quickly leading to the major coin series. From Cents to Gold. Easily sort and value your coins. An important step in preparing for selling coins and finding buyers.